The sport of canicross-racing with dogs-is taking off in Quebec. Like a miniature Boston Marathon, many canicross races begin with a silent, nervous bus ride to the start line. The runners sit, fussing with their GPS watches and anxiously sipping on their water bottles. But unlike the Boston bus, the runners sit next to their calm, carefree running companion: a dog. In less than a couple of hours, the dogs will be sprinting, dragging their owners through the forest. For now, they nap, leaving nose prints on the vinyl seat. “Think cross-country running while being hitched to a dog,” explains Héryk Julien runs Canicross Quebec and Foubraque, a training school meant to initiate those who’ve never gone running with their dog before. All you need is the basic equipment – a dog harness, a waist belt and a bungee cord. “The bungee cord is key,” Julien insists. Although the dogs are calm packed into the bus, the start line – in the middle of the woods – is a very different story. The start is chaotic. The dogs feed off of each other’s energy (and the nerves of their owners). When the gun sounds, it’s a sprint across an open field. The bungie cord is key because, in the first moments of the race, the dogs aren’t going to wait for their human partners. 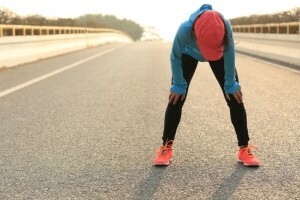 An experienced canicross runner must control their dog’s enthusiasm in order for both of them to get into a comfortable rhythm. Canicross has been popular in Europe for many years, but it wasn’t until a 28-year-old French doctoral chemist named Amélie Janin brought her passion for the sport to Quebec that it found a foothold in Canada. Janin started organizing events after arriving in 2006, and has since handed off the leash to Julien and his partner Laurence Boudreault when she moved to the Yukon for work. 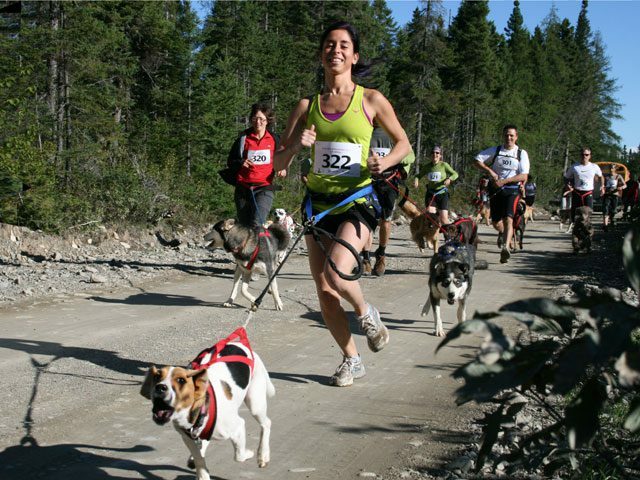 Canicross Quebec usually offers about five races a year throughout the province. Canicross Quebec has grown to over 300 members and the sport seems poised to take off in North America. Julien and Boudreault sensed the demand and founded Foubraque, knowing that it can be tricky to learn how to handle being pulled along by an eager four-legged companion harnessed at your waist. What does one do, for example, when their pooch is suddenly distracted by a squirrel darting across the trail? Foubraque’s running seminars teach runners to get comfortable running and racing with their dogs. Recently, the Ramsays took a risk and began marketing their products at marathon expos, and it has paid off. “We wanted to reach the real runners who like to have dogs with them while training,” says Shelley Ramsay from her office in Haywood, Man. Ramsay says the sport is most successful in Quebec, but has had many orders from British Columbia and Ontario. Canicross has yet to become as competitive or mainstream as it is in Italy, France or Great Britain, but its growth in places like Quebec and British Columbia suggest that the sport is poised to make big strides over the next few years in Canada. Canicross Quebec has another series of races planned for 2013, including the cani-Raid trial race in September. “It’s a challenging adventure race with bridges, river crossings and mud,” says Julien. If you own a dog, you know that they certainly do love mud. Michael Doyle is Canadian Running’s editor and routinely logs mileage with his dog, Charlie.